Thank you Lord for giving me a pool of lovely international customers whom purchase and appreciate my handmade products. This particular buyer, a owner of this blog site http://comateens.net wrote a beautiful article about sellers from DaWanda (a unique site to sell and buy handmade products from around the world). A kind and beautiful young lady whom love and appreciate handmade products by supporting us (handmade artisans). The following article was translated from “Babel Fish” translation (French to English). 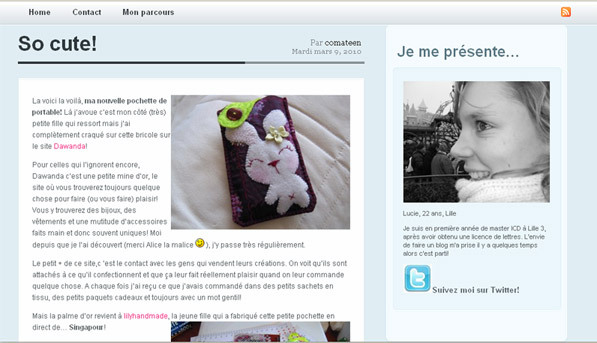 If you are able to understand French, kindly go to her blog (http://comateens.net/so-cute/#comments) for more detailed description. Thank you! .^_^. Here she is, my new laptop sleeve! Here I confess that my side (very) little girl comes out but I totally cracked up on that tinker on the site Dawanda!For those who do not know, Dawanda is a small gold mine, the site where you will always find something to do (or you) happy! You’ll find jewelry, clothing and accessories mutitude handmade and unique so often! Me since I discovered (thank you Alice malice ;-)), I spend quite regularly. + Little of this site, that is contact with people who sell their creations. We see that they are committed to what they make and that it makes them really happy when they customers order something. Each time I received what I ordered in small cloth bags, small gift boxes and always with a kind word! But the prize of gold returns to lilyhandmade, the girl who made this little pouch direct … Singapore! 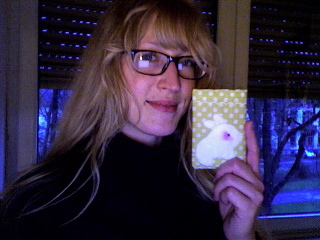 I rarely deal with someone as nice on the internet and when I received my package today, it was full of surprises: postcards, calendars, rulers, paper-bound small ribbons love … ! I have the feeling that gave me a gift!